A recently met with Green Tree Packaging, www.greentreepackaging.com.sg a Singapore based company that specializes in eco-friendly packaging and solutions to reduce municipal waste and championing biodegradable products. Much of their focus is on corn, sugar cane and plantation fiber that would otherwise be waste, but now a vital component in producing biodegradable packing and eco-friendly paper and materials. Comprehending the practicalities of change and certain realities, they are also involved in recycled plastic products and hybrid recycle plastic and natural fiber along with biodegradable plastics. In the ideal world, we should be reducing our dependency on plastics however to be realistic this will take time. But there is one product we should cease using altogether – now – the environmentally disastrous and unhealthy product – Polystyrene. The report below authored by Andrea Kremer and Raquel Pinderhughes from San Francisco State University covers the subject succinctly. Adding my personal observations, I cannot comprehend why any Government or local municipality can continue to condone the user of Polystyrene when there are viable alternatives available. It’s like continuing to use asbestos knowing of the acute health and environmental hazards. I have even heard of Government officials saying, “But it’s OK, everything is incinerated and we have specialized incineration facilities that are able to control the release of toxic vapors”. It is mindboggling how anyone can condone such hazardous products in the first place, little lone think the solution is to incinerate it and its all fine. How about not using it in the first place! Moreover, a good deal of Polystyrene ends up in the ocean where it only takes about 200 years to break-down and releases toxic substances all along the way. 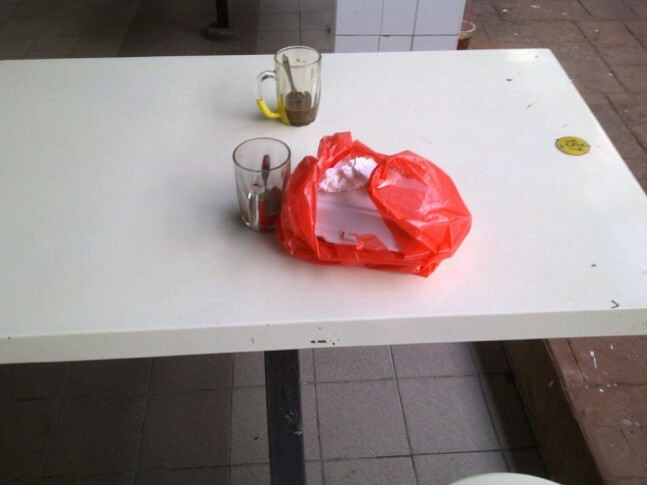 I eat breakfast at Hawkers Stalls in Singapore three or more times a week, and I am surrounded by Polystyrene and plastic, used blatantly for both eating in and takeaway. The amount of refuse generated on any one day is flabbergasting, and little of it even feasibly recyclable. It is deplorable and nothing will change unless the Singaporean Government takes action. And you should be asking yourself, when was the last time you took your own containers to put your takeaway food or drinks in? How many plastic bags have you used unnecessarily today? Styrofoam is a trademark of The Dow Chemical Company. This extruded polystyrene (XPS) foam was first discovered in 1941 by a Swedish inventor which was then acquired by Dow Chemical for further R&D into many other forms. Dow Chemical produced Styrofoam for building materials including insulation sheathing and pipe insulation. At a later stage, in late 50s probably, expanded polystyrene beads (EPS) were discovered. This is different from extruded polystyrene. Expanded PS beads are used mainly for disposable tableware such as coffee cups, takeaway boxes, etc. In all these years, Styrofoam has integrated much into our lives. We cross path with Styrofoam almost on daily basis and people simply assume it’s safe to use without knowing the ills it has brought along to our Mother Earth and to the end-consumers. One of the most common uses of Styrofoam associated in our daily lives has to be the use for takeaway applications for our food and beverage. It’s convenient for such uses because its light in weight, serves as good insulation material and it comes as a cheap option. Look around us and you won’t fail to notice what I mean. People are so used to have Styrofoam takeaway boxes for their takeaway meals. And in many offices, we are still using Styrofoam cups for the hot beverage. This seemingly “clean” looking food service tableware is conveniently the cheapest option. But little do we know about the ills that come along with it. Let us pay a little attention to the social, environmental and public health concerns associated with the use of Styrofoam in this write-up. The main components used in the manufacturing of Styrofoam are Benzene, Styrene and Ethylene, and of course the blowing agent needed for “foaming” to make it lighter in weight. Let us study each of the main components and understand the ills and harms it has brought along. Benzene or the other common name, coal tar, is extracted from coal and is also found in gasoline. The extraction of coal is very hard to the natural environment. The earth distributed around the coal mine from deep is virtually dead in that it cannot support plant life. This leads to erosion of land even long after the mine is closed for use. Working in coal mine has always been known of as a very hazardous job. Benzene is a clear, colorless liquid pretty much noted of its pleasant odor. Nearly 75% of all extracted Benzene is used in Polystyrene production. Other common exposures of Benzene are from cigarette smoke (one of the 4000 chemicals present) and from the exhaust pipes of automobiles. Benzene is the most toxic of all the chemicals components of Styrofoam and it enters the body either through the respiratory system or through the skin. Benzene is a known MUTAGEN, CARCINOGEN and is flammable. Short term levels of exposure have been known to cause dizziness, lightheadedness, headaches, vomiting, convulsions, coma, and death from irregular heartbeat. Long term levels of exposure have been known to cause skin scaling, leukemia, plastic anemia and death. Styrene is a clear, oily liquid with a slight odor. Styrene is actually “cracked” or extracted from petroleum. Report has shown that Styrene has gotten into our natural environment through the refining of petroleum, and especially in regions and areas close to these refineries. It can be found in many fruits and food source. Styrene is also very toxic in high levels, and is in the fatty tissues in every single one of us right now. It is listed on Hazardous Substances List as Mutagen, Flammable and Reactive. A mutagen alters one’s Chromosomal make-up. Styrene is also considered as neurotoxin. Short term levels of exposure can cause eye, nose and throat irritation. Long term levels of exposure can cause dizziness, lightheadedness, loss of consciousness, trouble in concentrating, memory problems, learning impairments, brain damage, fetal damage, fertility impairments, lung cancer and death. Food and beverage with high fats content and acidity level increases the rate of styrene migration. Heat is another factor that causes the same effect. Styrene is soluble in ethanol which is commonly found in alcoholic beverages. Using a Styrofoam cup for alcoholic beverage could also causes styrene migration as the ethanol in the beverage is said to dissolve styrene. Another factor is the presence of Vitamin A. In packaged foods with the addition of heat (such as microwave temperatures), vitamin A will decompose and produce m-xylene, toluene, and 2,6-dimethylnaphthalene. Toluene will aggressively dissolve polystyrene. This renders polystyrene as an unsuitable package for containing or microwaving products that contain vitamin A. Ethylene is a colorless gas that becomes a liquid at very low temperature. Ethylene is present in almost every plant and encourages plant growth. It has been used as one of the two blowing agents for Styrofoam. Ethylene is one of the main building blocks in the petrochemical industry and it is widely used as refrigerant. Although Ethylene is not known to be toxic but in large quantities, it can be dangerous as it is flammable. High levels exposure can cause frostbites with direct contact and with many gases, it can cause unconsciousness. Studies have suggested that a high possibility of the harmful chemicals used to manufacture Styrofoam might leach onto the food from the use of Styrofoam tableware. It has been observed that 0.025% of weight lost each time during the use of these products. These harmful chemicals that leached onto the food will eventually be consumed by the users. The question now is not whether such relatively small amount of these chemicals are enough to cause health concerns. The question to ask is whether we are allowing these chemicals to reside in our bodies to cause possible damages. Common sense tells us that long term, constant exposure to any foreign substances into our bodies causes problems and this should be the main point of concern when comes to investigating the health aspects from the use of Styrofoam food service packaging. As global population and affluence has increased, the pace of urbanization has also fastened tremendously. This has resulted in the petroleum based materials production to escalate in an alarming rate. This means, apart from the buildup of green house gases emissions in the atmosphere, environmental pollution also increases. This has also indirectly linked to many health issues once again. Polystyrene is basically hard, brittle plastic and doesn’t become Styrofoam until it gets injected with blowing agent which makes it 30 times lighter than its original weight. Ethylene / Pentane is one of the two blowing agents used in the production of Styrofoam. The other blowing agent used in the early days was CFC (chloroflourocarbons) and was later replaced by the controversial HCFC (hydrochlorofloufocarbons). Both are infamously related to the main cause of ozone depletion and hence global warming. HCFC are thought to be less harmful than CFC, in which a hydrogen molecule is attached to CFC-22 creating HCFC-22. HCFC is combined with Ethylene to create Ethylene Oxide (22% Ethylene). Many scientists are still very skeptical of the idea that HCFC-22 is much better for the environment as studies have shown that it is still an ozone depleting agent. Scientists have indicated that 5% of the earth’s ozone layer has already been damaged due to the use of ozone depleting agents. Another environmental concern caused from the production of Styrofoam is the water used in the manufacturing process. Water is used as the most economical way to cool the formed Styrofoam but the problem here is the industrial water waste goes discharged untreated into the sewer from many Styrofoam plants in this part of the world. When this gets into the river and into the sea, the coastal and marine ecosystems continue to deteriorate because of the irresponsible act of human activities. Phytoplankton, the basis of the food chain in the ocean, gets affected and this has directly or indirectly affected the ocean organisms that feed from it. Eventually, human consume ocean creatures and the vicious cycle that human had created will end up with us. Styrofoam waste can be commonly found in the sea. These Styrofoam articles are not readily digestible and may accumulate in the digestive systems of some sea birds and sea turtles causing possible death by starvation, thus reducing their population. Styrofoam is persistent on land and in water. It will not biodegrade readily in the environment unless chemically modified by heat or chemical action to reduce the molecular size. Exposure to sunlight will increase the degradation process slowly over time, probably takes couple of hundred years to breakdown and hence causing landfills problems in many countries. And knowing that it is produced from many harmful petrochemicals, we might wonder what these Styrofoam packaging breaks down into eventually? Instances where most waste including Styrofoam goes to the incineration plant, burning of Styrofoam releases more than 90 different hazardous chemicals, including Styrene vapors and dioxins. It may be true that some countries may have the specialized incineration facilities that are able to control the release of these toxic vapors to a certain level but what about those countries that doesn’t own one. With the above findings and information provided from reliable sources, we can be pretty sure that Styrofoam truly poses many existing health and environmental concerns. High possibilities of chemical migration into our food from the use of Styrofoam food packaging will lead to toxic building up in our bodies which will eventually lead to series of health failures. On the environmental aspect, the fact that Styrofoam is made from petroleum, a non-renewable resource that requires millions of years to form, has surfaced the sustainability concerns to many. The harms it has brought along to our Mother Earth are immense. Let our collective voices be heard and change for a better starting from today.